Chinese courts have now begun to loose the criteria for recognizing and enforcing foreign judgments, so that China can better adapt to the trend of market opening, and increase the likelihood of Chinese judgments being recognized and enforced in foreign countries. Since 2017, China’s Supreme People’s Court has been sending such signal and is drafting special rules in this regard. China Justice Observer (CJO) maintains its focus on this field, and endeavors to share updates on the latest developments with the international community. In addition, Guodong Du, Founder of CJO, and his team are devoted to providing legal services for the recognition and enforcement of foreign judgments in China. 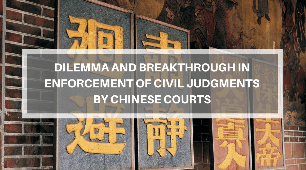 Chinese courts have long been faced with the difficulty of civil judgments being effectively enforced. However, in recent years, Chinese courts have undertaken various measures, which lead to significant efficiency gains in the enforcement. For decades, China has adopted rigorous criteria for the recognition and enforcement of civil and commercial judgments rendered by a foreign court. However, the situation will undergo considerable changes.